With our new Deep Tea Diver Tea Infuser! 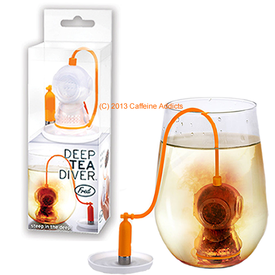 Explore the vast underwater scuba world of loose leaf tea with our Deep Tea Diver! It's dishwasher safe, food safe and the 'air tank' serves as a handy counterweight so you can immerse it to any depth from cups to pots. It can handle whatever type of tea you toss inside and then lower him into the drink! So ditch the teabag, fill up his silicone wetsuit, and take the dip! Ahhh, oceans of flavor! Great for ocean enthusiasts, tea lovers and divers of all ages. Deep tea Diver is molded from durable, pure food-safe silicone, that can withstand temperatures from -22 degrees F to 450 degrees F. Dishwasher & microwave safe! Mug not included. MAKES A GREAT GIFT FOR ANY TEA LOVER!! AS ALWAYS FAST & FREE US SHIPPING AND FREE SHIPPING TO ALL FPO / APO MILITARY ADDRESSES! !